Ahhhh…. 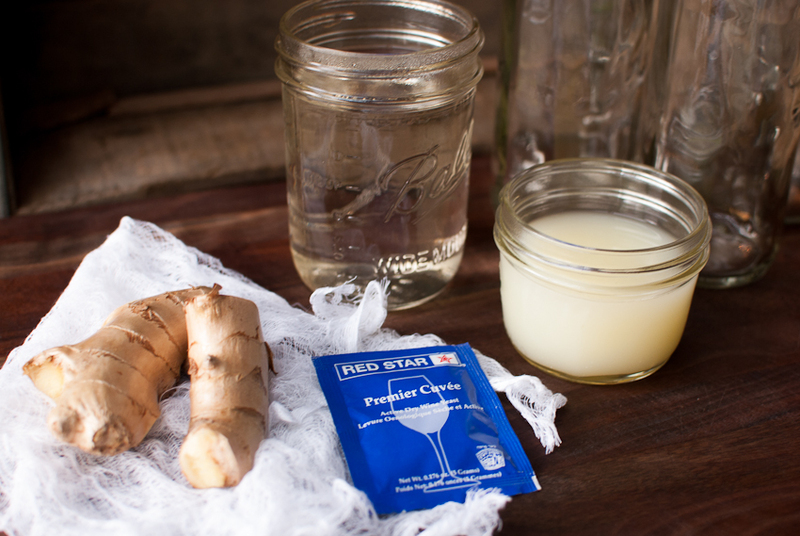 the most important ingredient in a Dark N Stormy….Ginger Beer! Well ok, maybe second, we must have the rum eh?! I fell in love with this cocktail a few years ago while visiting a Seattle bar, I can’t remember the name of the bar, but I remember the cocktail! Dark N Stormy, just the name sounds so intriguing and mysterious! That was the beginning of my crush with ginger and rum! Of course, I wanted to recreate these tasty concoctions on my own, but the price of ginger beer is outlandish! Yes, insane! Fever tree makes a great ginger beer, but for a 4 pack of 8oz bottles, it’s $8-$10 bucks. Maybe you will get 4 Stormy’s out of that pack, yes still cheaper than ordering from the bar, but not cheap enough! So the search began for a ginger beer recipe…. I came across Jeff’s blog. He has many great drink recipes on his blog and is a bartender in my home town! What if I told you, you can make roughly 5 16 oz bottles of your own Ginger Beer for about 5 bucks!?! Yes my fellow cocktail drinkers, you can! 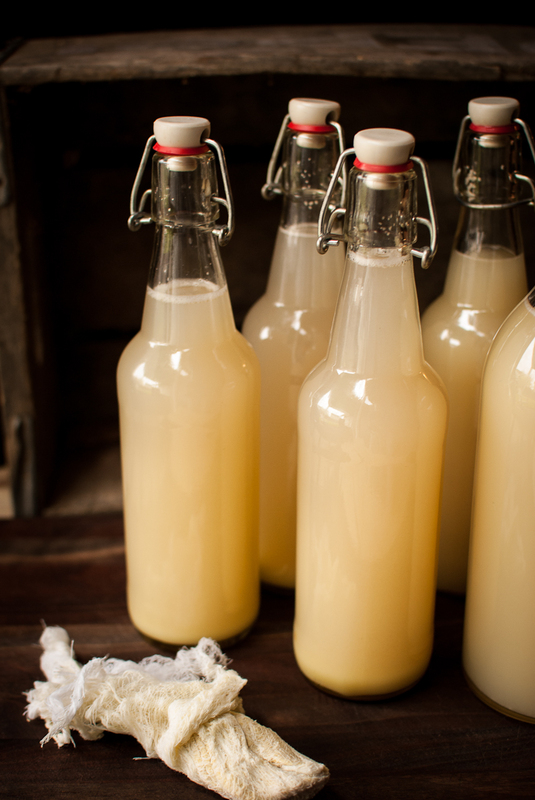 You need fresh ginger, simple syrup, fresh lemon juice, warm water, and cuvee champagne yeast. And your bottle of preference to hold the goods. Through many trial and errors, I have discovered the best way to get the juice from ginger is run it through the food processor, pulsing and scrapping down the sides many times. 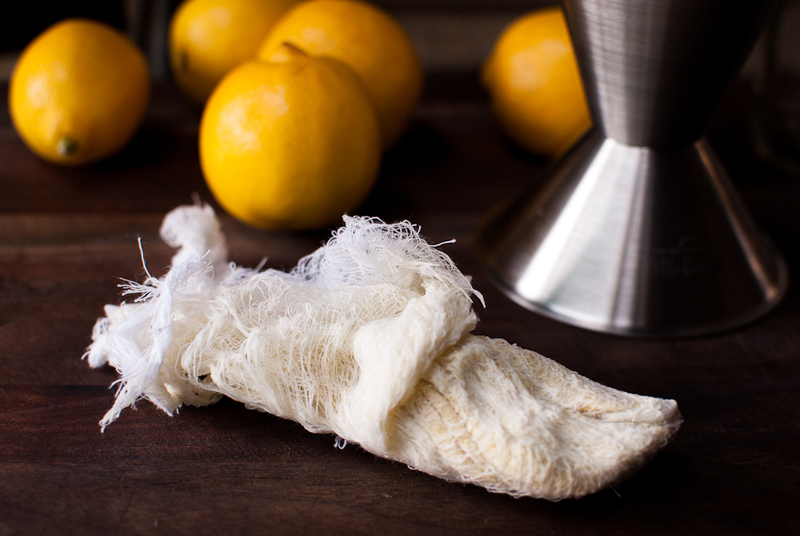 Then squeeze the pulp through cheese cloth. This save loads of time and you get the most amount of juice from the ginger. I don’t recommend a blender, as the skin would probably gum up the blades and you will not end up with a finely shredded pulp. I used to shred the ginger with a cheese grater, and that process took a long time. It also wastes a lot of the ginger root. I found my flip top bottles at a local beer/wine supply shop for a few bucks a piece. I also found the cuvee yeast there too. 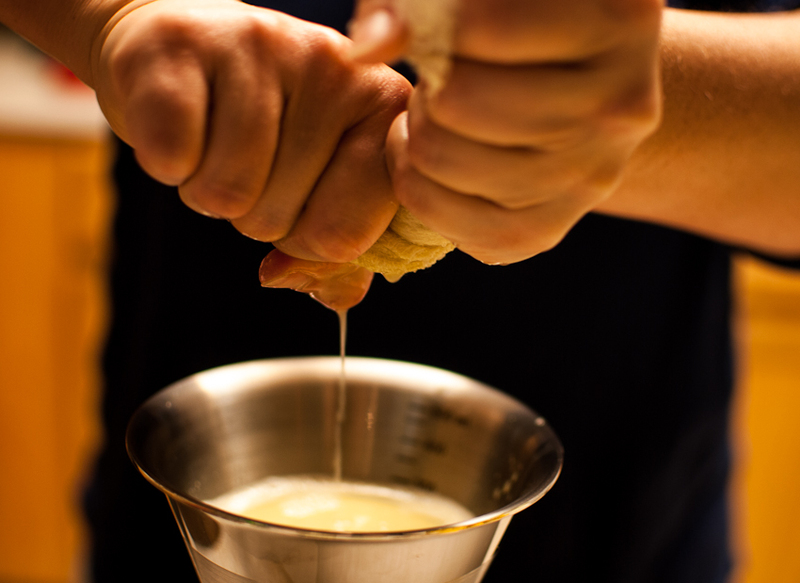 This is not a yeast you can find in the baking aisle of the grocery store… this is a speciality yeast for beer making. The packets have thousands of granules per packet, it goes a long way. It also costs about a buck a packet, the unused granules can be stored in the refrigerator till your next batch is made. This is what ferments the beer and carbonates it. Peel the ginger and pulse in a food processor until very shredded. It should feel gummy and soft. Place shreds of ginger into cheese cloth, and squeeze the juices into a bowl. Mix the ginger juice, lemon juice, simple syrup and warm water into a large bowl. Next add the yeast granules into the bottle, secure tightly and give it a quick shake. Let rest in a cool, dark place for 48 hours. Then place into the refrigerator to stop the fermentation process and enjoy. Your ginger beer is now ready! *Note- this makes 1 16oz bottle. I usually make a batch of 5-6 bottles at one time so adjust the recipe for the amount you are making. Also- about one large piece of ginger will yld enough juice for about 6 bottles. The ginger in the picture above is a small piece, enough for about 2 bottles. You.are.brilliant. Almost all of my favorite drinks include ginger beer. In fact, if I see it on the menu, I almost always order it, and I had NO IDEA I could make my own!!! This is my favorite post I have read in my ridiculously over filled reader in weeks!!! Love love love!!! Your ginger beer looks great, I’m really keen to try the recipe! The only thing is that it’s not non-alcoholic. You’ve used yeast to carbonate it, and a natural byproduct of yeast doing its thing is alcohol. I can’t say how alcoholic it would be, but as it’s not removed from the beer at any point it will contain some alcohol. I’m sooooo going to try making this. We love dark n stormy cocktails plus this drink called “Virginia Gentleman” that we make calls for ginger beer. I think this is awesome! Thanks for sharing. This is so exciting! I had no idea that you could make ginger beer, but that Fever Tree stuff is so good! I actually love just adding a little bit to carbonated water for a bubbly, ginger infused drink that isn’t quite so sweet or strong (makes the good stuff last longer too, you know?) Thanks for sharing your recipe! This looks like an awesome recipe and sounds perfect for exactly what you said! Making a cheaper ginger beer. Since you only let it sit out for 48 hours you won’t have that much alcohol produced! Be warned that if the liquid/yeast warms up (ie if it sits out on the counter) the yeast will reactivate and continue to produce alcohol! If it is covered and builds up too much gas you could end up with an explosion!! lol BUT given what I’LL be using it for – a little extra alcohol can only be a good thing! Thanks for this!!! Great post! Can you please tell me what cuvee yeast is. The only yeast I know of where I live is fresh or dried. Thanks!! I remember years ago my mother making ginger beer and it produced what was called a ginger beer plant, which you then made more ginger beer from. 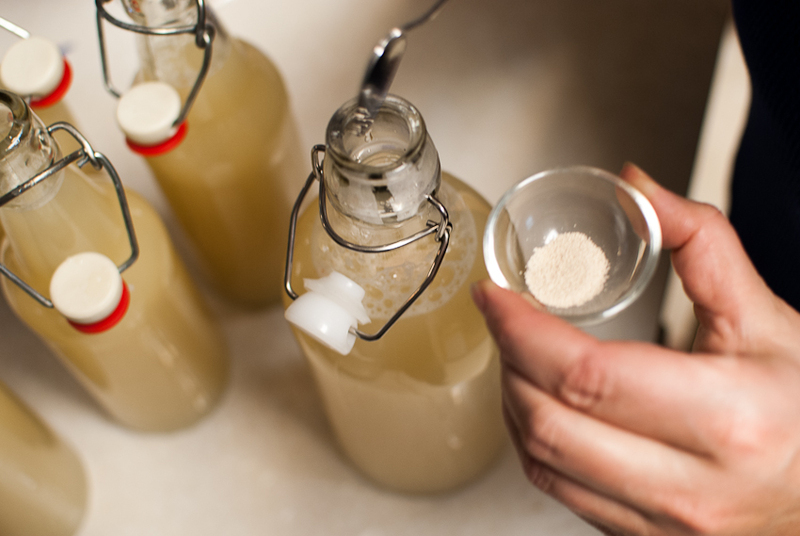 You may also find the yeast at a local Homebrewing or wine making store. Btw, my wife and I intend to make this soon. We enjoyed Dark N Stormies in Bermuda years ago. i make over 50 L of this a week. its awesome. Wow, that’s a lot of Ginger Beer! This is such a great idea! My husband LOVES ginger beer, but it is so expensive at the grocery store. 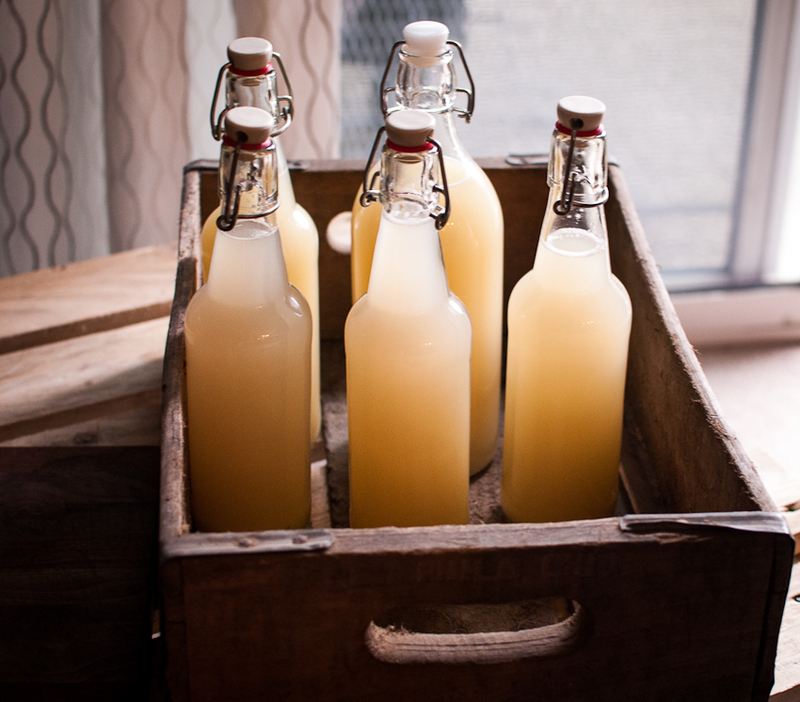 I’ll definitely be making your ginger beer recipe this summer! First time making and trying ginger beer it was really good. Thanks for the great recipe. i just wonder if there is an easier way to get more juice out of the ginger. bought a pretty large piece and was only able to get out 1oz enough for 1 bottle. Thank you so much for this post! I made the ginger beer on Friday and finally tried it this morning. For a first attempt, I was rather pleased — definitely more ginger in my next one. Question: how on earth did you manage to get 25 granules of yeast in each bottle? I think that I did quite a bit more than that. This morning, the ginger beer had a slightly fermented taste to it; not unlike a kambucha. Any tips on measuring the yeast? Hi Andy, glad you made a batch! To measure the itty bitty tiny granules, I just guesstimated it, poured them into a small glass bowl to try and see the granules. Great post! Can’t wait to try to make some. About how much would you say 25 granules of yeast is? About 1/8 tsp? Thanks for sharing this recipe! On my first trip to The Islands,I had this drink and fell in lover with this drink! I can’t wait to make this drink.Thanks for sharing this delicious drink.The drink I had,had a hint of spice to it.Can you tell me how much yeast to use? Should I use a teaspoon or is that too much? I love ginger beer! where did you buy the bottles ? I bought the bottles at my local brew supply store. What is the simple syrup? What kinda syrup? Can’t wait to try this! we’ve been doing different types of beer at home, and this sounds like a great alternative. Those bottles are gorgeous! Where do you get them from? We have been looking for something similar for a while. Jen, thanks for stopping by! We found these bottles at out local brew supply store, I’ve also seen them online. Cheers! Hi! So excited to try this. Do you shut the lid after you put the yeast in or leave it open a while? Can I share this link on my blog? Fun! Have you tried putting the ginger (cut into smaller chunks) and warm water together in a blender or food processor first, then strain it? That is what I do for an African drink called nyamakuji and it works pretty well! I guess I’m just not sure quite how much ginger you would put in at first.. anyway thanks for sharing the recipe. I have been wondering how to do this! Made it yesterday afternoon, today I checked on it and gave it a shake, bad idea minuets later I heard something pop, it was my ginger beer. Second attempt today, I will not shake the bottle. Tiffany, how long can you store this Ginger Beer and would it have to be in a cool, dark place? I haven’t read all the comments so you may have already answered this. I was also thinking this would also be helpful heated in the winter, with a little Rum added as a hot toddy when you are sick with a cold or the flu. It only lasted a few days in our house (many cocktails made with this) so I can’t say how long it would last :) Good luck! This sounds great! Any idea if I could just peel the ginger and then just run it through a juicer to extract the juice? I think that would work just fine… Cheers! I have a Huron and a omega juicer. I peel the ginger and cut them up in pieces and run it through the juicer…it’s like liquid gold! It keeps for about two months or so. I will definitely make this beer! I’m late to this post but at Whole Foods you can purchase your own ginger and ask them to juice it for you if you have a Whole Foods that offers juicing. Also, once you open the bottle, can you reseal and use later or does it go bad? How long is the shelf life? I think it’s only good for a few days. Ginger beer is a typical homemade drink made during the Christmas Season in the Caribbean which people exchange with neighbors and friends together with a piece of Christmas cake…bottled in recycled 26oz rum bottles – of which there’s always plenty around!! Instead of yeast, put a handful of rice grains in the mix of ginger and lime juice and sweeten to taste with white castor sugar. Another Christmas homemade drink is Sorrel – you can find the dried sepals, maybe in Whole Foods? Steep in boiling water with a couple of cloves, sweeten to taste using either brown or white sugar; let sit for 48 hours, adjust taste if necessary and bottle; either drink straight or in a cocktail made with a shot of liquor of your choice…great with rum, gin or vodka…Enjoy!! The other day, the grocery store I shop out was sampling ginger beer mixed with bubbly apple cider. It was a great mocktail! I just love the ginger beer by itself, so I can wait for the batch I’m brewing to finish up. Yumm! I’ve made this recipe a few times now and I have done some experimentation with different proportions and today made 64 ounces using meyer lemons for a twist. I do have a question though – I always get a white sediment on the bottom of the bottles that likes to settle and then stay at the bottom. What is this, should I be concerned, and is there a way to strain it out? Hi there…. the white sedement on the bottom is yeast, I usually discard the last bit. Thanks Tiffany! One more follow-up question. Today, at the 48 hour mark I opened one of my bottles to check the carbonation before putting them in the fridge and there appears to be no carbonation. I’m concerned my yeast was bad. Can I buy fresh yeast tomorrow and add it, or will that mess this batch up? I think you may need to start over…you could try it, but chances are slim it will turn out. Let me know how it turns out! I made a batch and just mixed it well each time I poured a glass. The “white stuff” Yeast just mixed in and went down the hatch! Get a juicer – it so much easier than the food processor method. What a great recipe!! I used to make an instant ginger powder, that contains a lot of sugar.. But, Is it possible ti carbonates the liquid without produce any alcohol? This is a great refreshing drink. I can’t get enough ginger in my recipes. This ginger beer is a wonderful refreshing drink. My first batch was four bottles according to the recipe. I just finished making my second batch. However, since I really like a strong ginger flavor, I experimented for this batch and reduced the lemon juice to 1.5 ounces and increased the ginger juice to 1.5 ounces. I can’t wait to try it. I will follow up and let y’all know how it turned out. Hi! Thanks for the recipe! I made enough for a 2L grolsch bottle, is 2 days enough wait time for roughly 4x the recipe’s batch size? I left a good amount of space, about the whole neck. (3″tall, about 1″wide). Greetings, this is on my list of MUST DO’S this year. I love the Galvanina Ginger Beer, what I love the most is the trace of chili pepper to give you a zing of spice at the end of the taste. I am going to use your base then TRY to replicate the GGB drink. Thank you. May you find contentedness throughout the year.